From what I’ve heard, there is a sizable contingent of Boston-area bartenders, writers and cocktail enthusiasts heading to New Orleans this week for Tales of the Cocktail. I’m looking forward to running into my fellow New Englanders wherever I go, whether it’s the panel on gin called “Juniperlooza: A Journey Deep into the Heart of Mother’s Ruin,” the French 75 bar at Arnaud’s or the cemetery where part of Easy Rider was filmed. New Orleans is still doing some serious rebuilding and repopulating three years after Hurricane Katrina, and for me and a lot of other attendees, Tales is partly about showing the natives some moral support and generating some cash for the restaurant and hotel employees who make our good times roll. So leave a nice tip for that Sazerac, which, in case you hadn’t heard, was just declared New Orleans’ official cocktail by the Louisana legislature (thanks in part to Tales organizer Ann Tuennerman). Writer, bon vivant and New Orleans native Chuck Taggart, whom I’m looking forward to seeing again this year, writes lovingly about the Sazerac here. Scroll down a bit for the recipe, and be sure to follow it to the T if you want to taste the real thing. 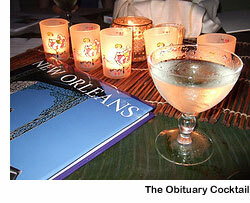 I’ll be drinking Sazeracs (and Obituaries and Vieux Carrés) this week and blogging from the Crescent City. 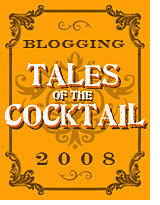 I’ve been drafted to represent Tales of the Cocktail 2008 at the Boston Globe Travel Show this Friday and Saturday (February 22-23). TOTC Founder Ann Tuennerman is busy promoting her event elsewhere around the country, so I, along with Misty Kalkofen of Green Street, signed on for the job. Since Misty and I (and several of our fellow Boston cocktailians) are attending TOTC again this year, you’ll be hearing more about this be-there-or-be-square cocktail party as its time (July 16-20) nears. And, of course, there’ll be posts about the event during and after the fact, just like last year. Misty’s and my presentation will involve a few cocktail demos, of course. Two of the featured drinks celebrate New Orleans and its cocktail history; the third gives Travel Show attendees a taste of what’s happening in today’s Boston scene. 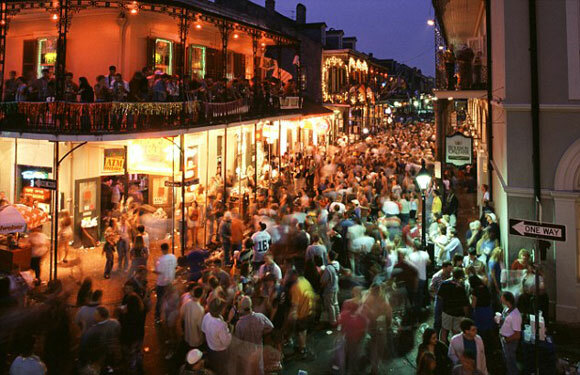 Try them out yourself while you plan your trip to New Orleans this summer. FYI, we used Hendrick’s gin (a TOTC sponsor) in the recipes below. Stir all ingredients well over ice and strain into a cocktail glass. 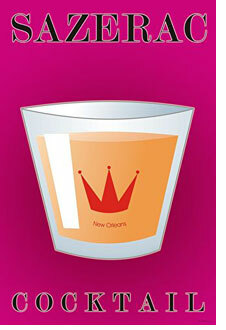 This cocktail was created at Jean Lafitte’s Blacksmith Shop on Bourbon St., one of New Orleans’ oldest saloons. Shake gin, lemon juice and simple syrup over ice. Pour into champagne flute or saucer and top with Champagne. 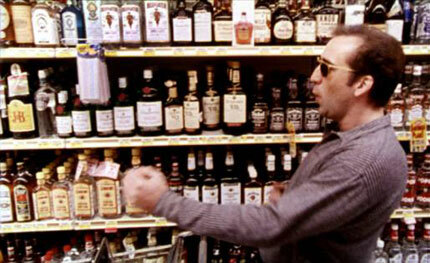 The bar at the famous New Orleans restaurant, Arnaud’s, is named for this drink. The drink is, as you know, named for the rapid-firing cannon the French used in World War I. Shake all ingredients over ice and strain into a cocktail glass. The Flapper Jane was created for the LUPEC Boston Tea Party.